Favour Igwe (‘22) represented her home country of Nigeria. An opportunity for international students, allies, and domestic students to come together in an exchange of culture through clothing, the International Fashion Show was held in the Center for the Arts atrium on Saturday, Oct. 27. The International Students and Allies Association sponsored the event that represented 32 countries with 64 participants, both international and domestic students. The theme for the night was to encourage inclusivity. 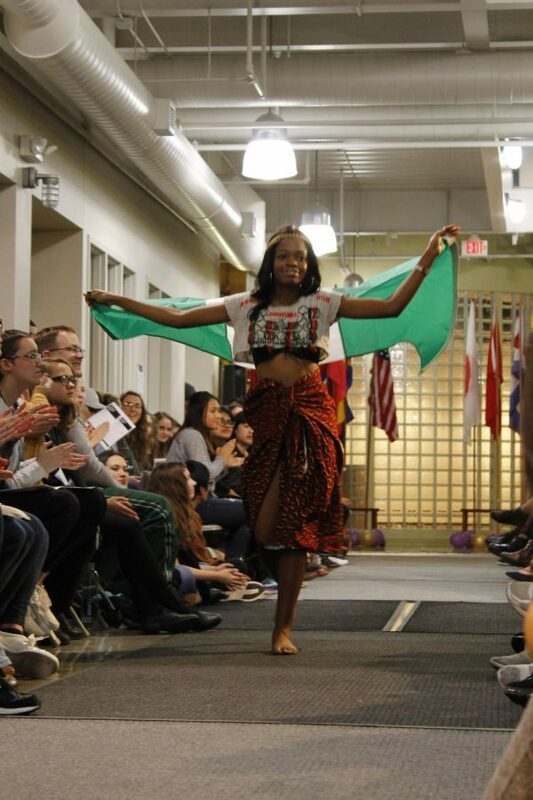 As part of the annual tradition, students have the opportunity to showcase their international attire to represent their culture and where they are from. Some national attire is only worn for weddings, while others are specific for funerals and other ceremonies. The fashion show tries to showcase various aspects of each student’s culture by providing examples of certain outfits for different occasions. 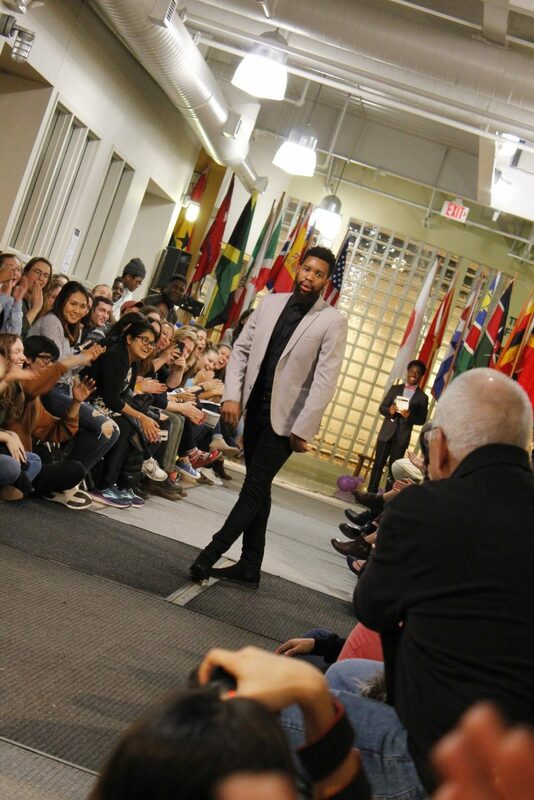 Along with showcasing national attire, the fashion show also provided opportunities for students to model original designs and formal wear. Mutsawamwari Makufa (‘19) modeled in the formal category. Peilla Ishimwe (‘21) modeled a dress that her mom made for her that is typically worn for events such as weddings, funerals, and special occasions she celebrated at home in Burundi. Ishimwe requested the colors she wanted in her dress. She was excited to put the dress on for the first time because it reminded her of home. Emma Everitt (‘21) represented her Russian heritage. Domestic students also walked in the fashion show. 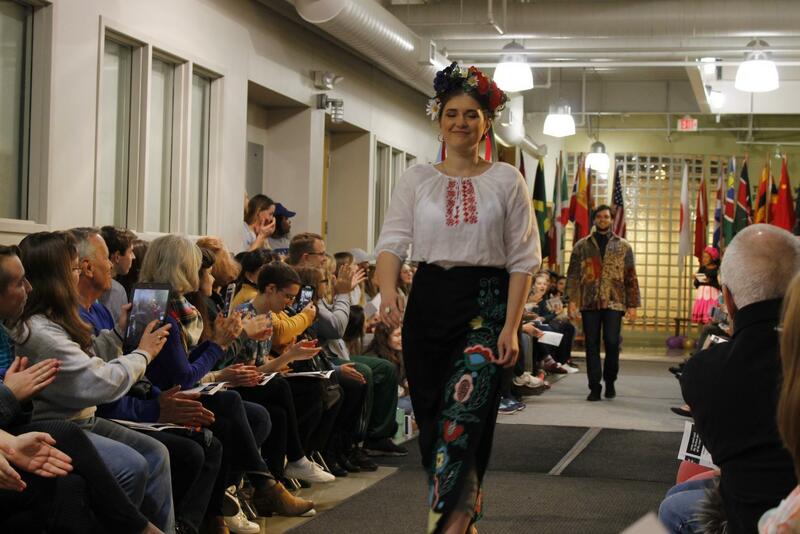 Emma Everitt (‘21) identifies with her Russian cultural heritage and saw the fashion show as an opportunity for her to make her heritage visible on campus. Everitt contacted Full Professor of Russian Studies Laurie Iudin-Nelson, who allowed Everitt to wear a piece from a collection she had. In the dress Everitt modeled, different layers and patterns were unique to the traditional Russian style. Her dress was accented with the color red throughout the pattern. “In Old Russia, the color red meant beauty, so all of the colors and patterns, especially red, [are] supposed to symbolize beauty in Russians,” Everitt said. Getting a glimpse into the heritage of each piece captured the knowledge the students had about their culture. Jorania Alves (‘22) modeled a tais feto, a traditional strapless dress from East Timor. Ruivaldo Freitas Viana (‘22) wore the masculine equivalent — the tais mane — which uses the same fabric in a different style. Alves’s costume reflects the hard work put into making the clothing and the specific region of East Timor. Alves brings her traditional clothing with her when she studies abroad because it helps her feel connected to home, which is a similar experience for many international students at Luther. It provides a sense of comfort when they experience homesickness. Ishimwe wanted to convey what it felt like to wear her traditional clothing in terms domestic students would relate to. She compared it to college students going home after being away at college. 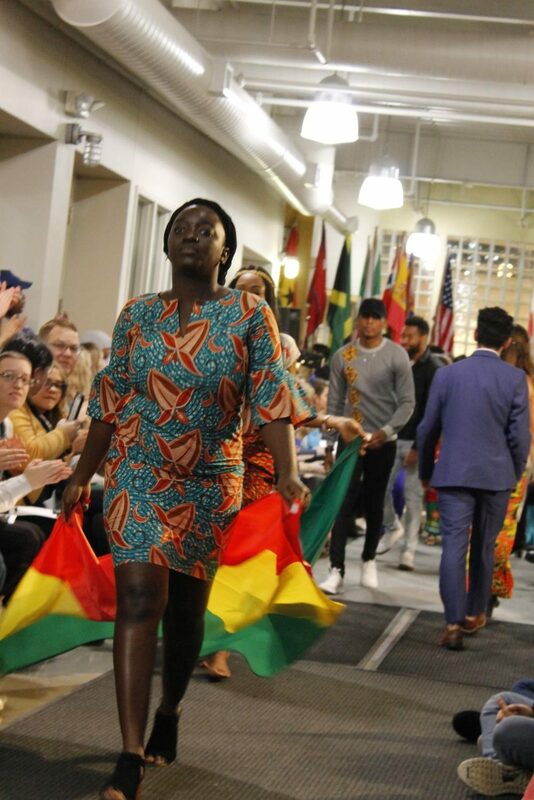 Ursula Damtse (‘22) carries the flag of Ghana. According to Nana Anim Asante-Apeatu (‘21), ISAA works to emphasize the importance of having international and domestic students share an exchange of culture. The goal was to give all students an outlet where they can express their culture and where they come from, which is why domestic students were asked to model the clothing made and brought from home countries of international students or clothing that represented their heritage. The show also incorporated brief performances that reflected the attire being modeled. K-Pop dance, Afro Dance, and a song sung by Kimberlyn Perez-Salazar (‘22) were performances that represented different aspects of culture from different countries. These performances expanded upon the event by incorporating other cultural elements into the celebration of diversity. Attendee Anna Northenscold (‘22) was inspired by the immense knowledge performers had about their culture’s traditions. “I thought it was interesting the amount of knowledge all of the international students have about their own culture, their country, and every single aspect of it versus how much I know about my culture’s clothing and what we do and the reasoning for it,” Northenscold said.